Congratulations! 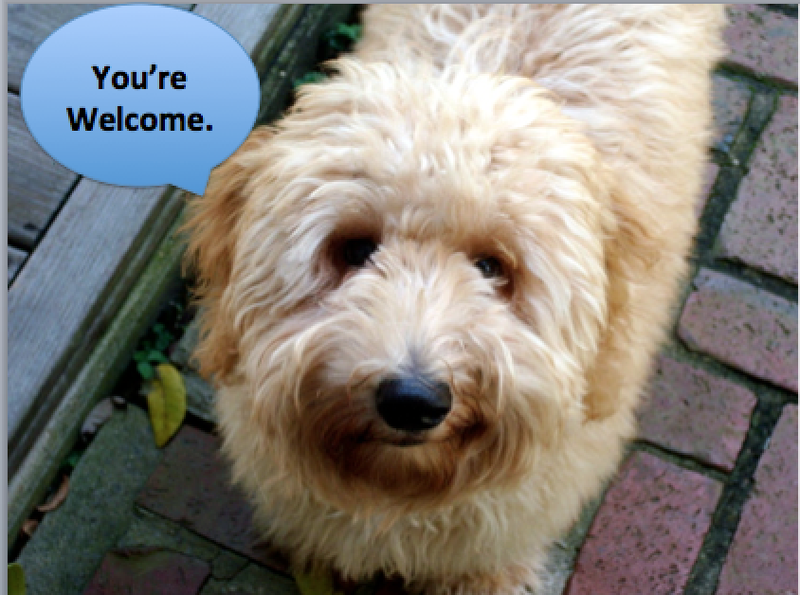 After careful review, you have been selected to oversee my 8-year-old Australian Labradoodle, Uncle Jesse, while I’m away. Given the exceptional taste you’ve demonstrated by reading this blog, I feel marginally concerned certain you’ll be able to accommodate my dog’s daily demands. Because I’m so confident in your abilities, I’ve attached only the abbreviated version of my 137-step guidebook. If at any time you find yourself doubting your caretaking capacity, please call one of the nineteen numbers I’ve listed in the back of this manual. It’s imperative that both you and Uncle Jesse remain hydrated at all times during his stay. This includes, but is not limited to: chilled, Brita-filtered water, refreshed 6-30 times per day, washing and drying the bowl after each rotation. In a pinch, you may provide tap water; we strongly discourage the use of bottled water. You will know you’ve misstepped if you’re greeted by this pose. Uncle Jesse insists upon an on-demand supply of V-Dog kibble. If any kibble goes uneaten for more than 12 hours, please sample before deciding whether to discard. Regarding the placement of his bowls, please select a warm, well-ventilated, cushioned area of the home where he will feel comfortable dining in his preferred reclined position. Uncle Jesse has grown accustomed to 5 miles of brisk walking out-of-doors each day; however, this can be broken into 2+ segments as we understand your employer refused to provide a leave of absence for this visit. Uncle Jesse prefers the unsullied Maine wilderness, so I’ve emailed you a weekend itinerary that would allow for the 16-hour roundtrip. Assuming you’ve strictly followed steps 1-3, you can expect an impressive number of bowel movements per day. These occur in varying volume and composition during the aforementioned 5-mile walk, so carrying an array of multi-sized “poop bags” is prudent. Please refer to attachment B for a list of defecation coordinates that meet Uncle Jesse’s poop-to-house-distance ratio requirements. Uncle Jesse is deeply committed to “total wellness” and therefore insists upon 12+ hours of uninterrupted rest time per day. Please leave your bedroom door ajar at all times. I noticed you had extra pillows on the couch. I suggest moving these to the bed while he adjusts to sleeping in a new location. Placing towels on the bed to protect your linens will only arouse his rancor. You’ve probably heard that most dogs enjoy fetch. Being of a highly sensitive nature, Uncle Jesse would rather remain indoors for playtime, with you sitting on the ground and tossing his toys directly into his mouth while he perches on the couch. If you fail to amuse him, he will notify you by placing the toy between his chin and the pillows that I’m sure you have remembered to return to the couch before beginning this exercise. Uncle Jesse and I are still reviewing the finer points related to the presence of any…well. You know. At this stage in our discussions, we would both prefer if you locked any “Others” in the basement for the week as we believe it will reinforce the natural balance of things and keep all parties safe from psychological harm. We’re just looking out for your well-being here. Uncle Jesse has an ever-expanding repertoire, with evidence of his aptitude appearing at 10 weeks old. To maintain this intellectual agility, we enjoy practicing shake, stretch, sit, lie down, paw, other paw, little speak, big speak and “Watch the hair, huh!” on a daily basis. Please also feel free to pass by our local Catholic church at 7:00am, 8:00am, 9:00am, 12:00pm and 6:00pm so that he might work on his pitch. Do not, under any circumstances, tamper with his hair, nails, ears, or teeth. If he appears standoffish, remember to say “please” before asking to pet him. Should you need to chauffeur Uncle Jesse, please leave the back passenger side seat free (he will not tolerate the other side), and leave the window rolled down fully, provided the speed does not exceed 45 MPH and/or the temperature remains above 50 degrees Fahrenheit. If you do not excessively stare, he will permit one rearview window photograph per car ride. And not to worry, dear reader – those new lights in each room are simply CIA-approved surveillance cameras.